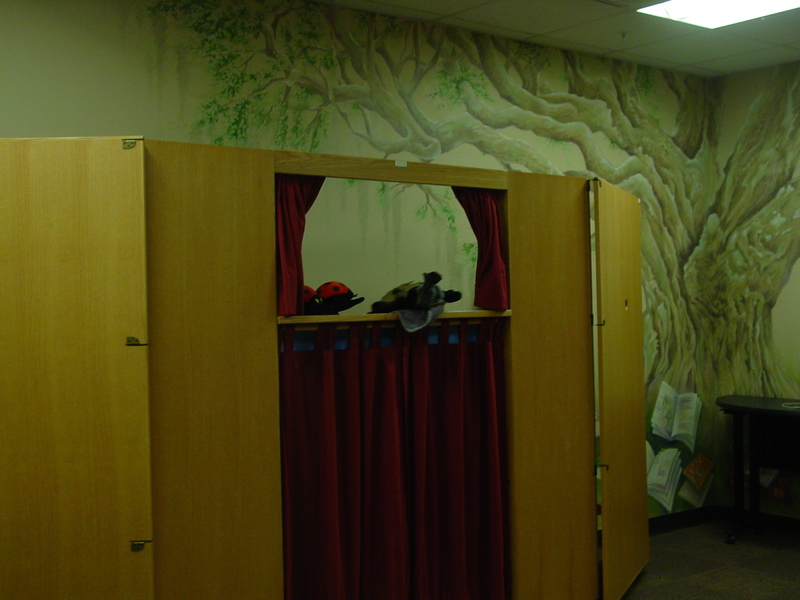 One of my favorite programs at our library is our “Starlight Puppet Show & Story-time.” During this event, we invite all of our kids (ages 10 & under) to come to the library at night. Everyone dresses up in their pjs and brings their favorite stuffed animal or blanket. 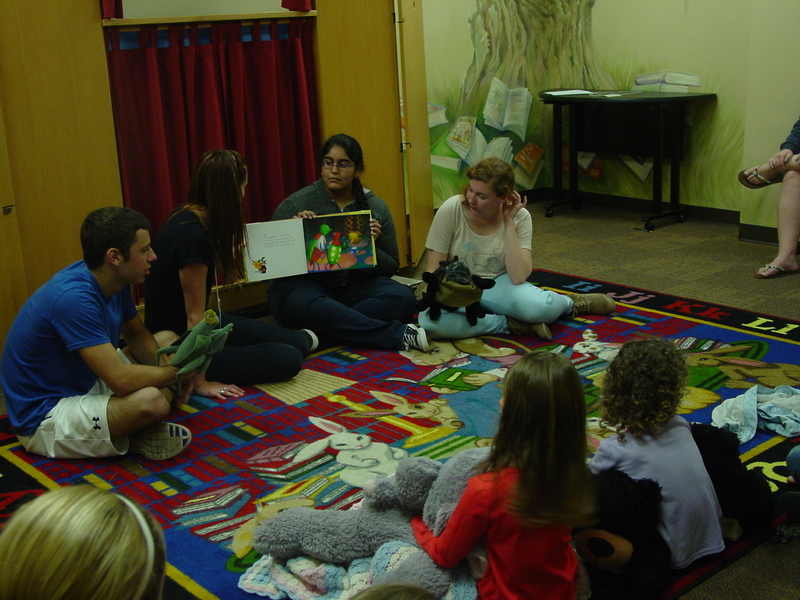 Then they all settle in for 30 minutes of puppets and story telling. It truly is a special and dearly loved program. 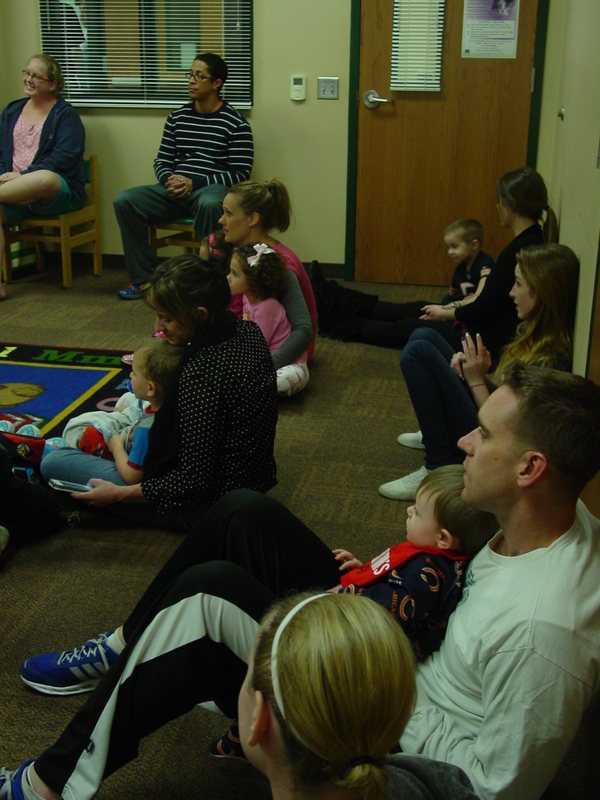 Despite the late hour, we still average 15-20 little ones in attendance. 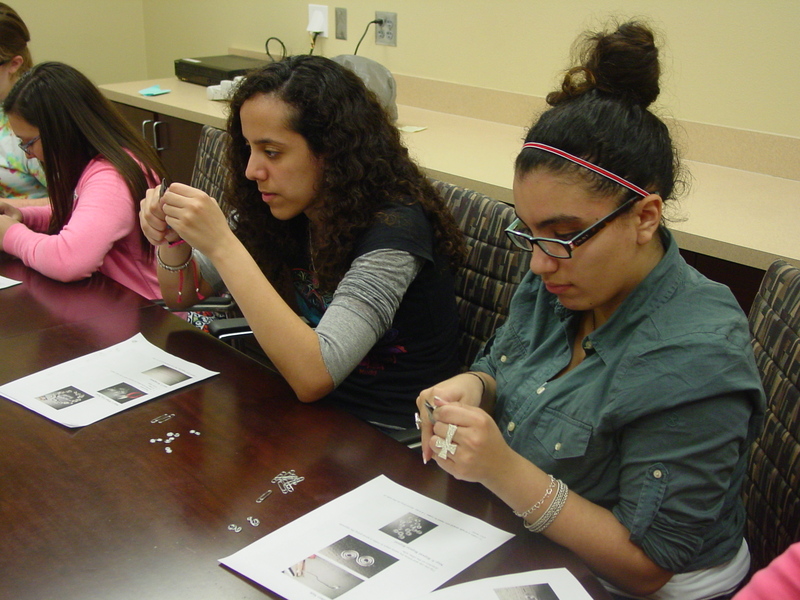 It’s also exciting because it gives our teen volunteers an opportunity to lead. 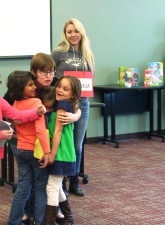 Our more charismatic teens help serve as puppeteers and interact with the kids. 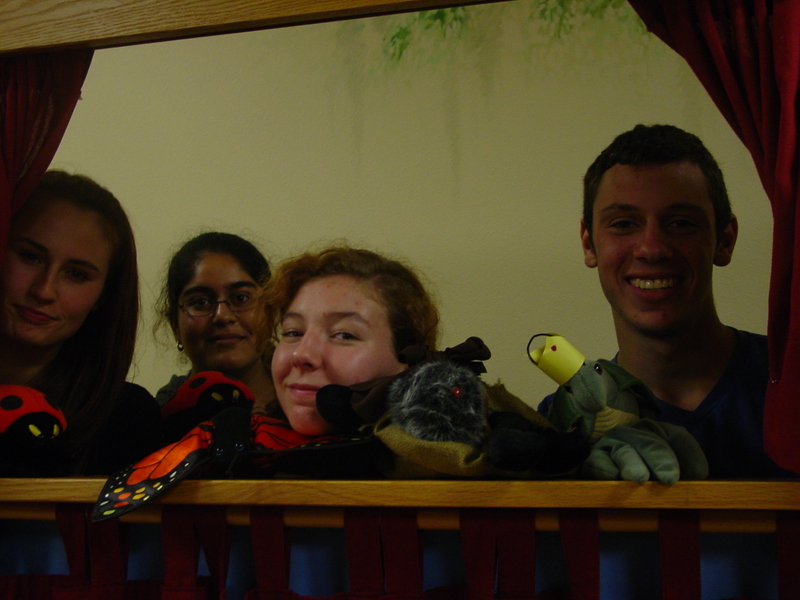 Our most recent puppet show featured the story of Spiderella: a retelling of the Cinderella story. With bugs. 🙂 It was a tremendous hit with our kids. Afterwards, we read a few Miss Spider picture books. I think we’ll continue to use fractured fairy tales as part of our puppet shows in the future. If you’re looking for ideas, I highly recommend 12 Fabulous Funny Fairy Tale Plays as a resource. 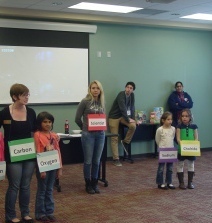 For this month’s “Yuck @ the Library” science program, I wanted to teach the kids about atoms, molecules, and chemical reactions. Not an easy task for little minds! Molecules and atoms are very abstract subjects and can often be hard to grasp. So I decided to do the “Salty Soda Balloon Experiment“ to illustrate what happens when two different chemical molecules interact (especially under pressure). 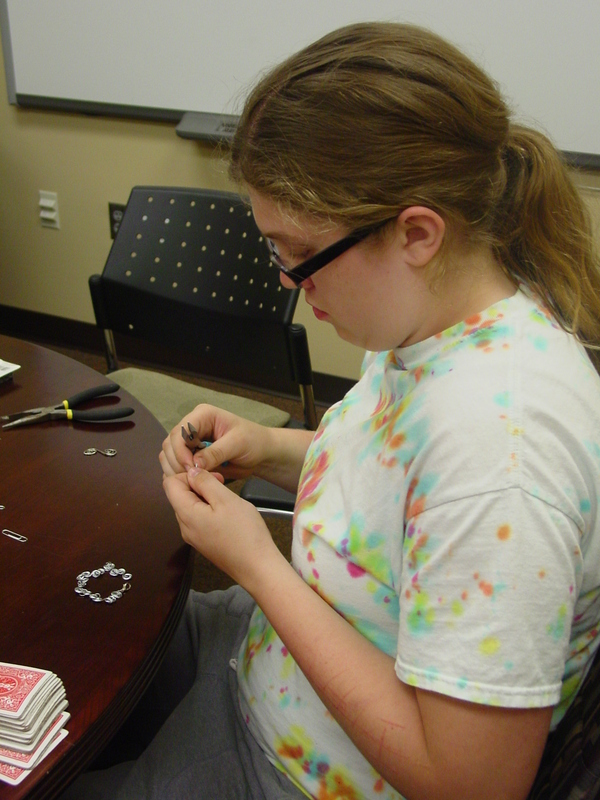 This activity requires some hand-eye coordination skills. 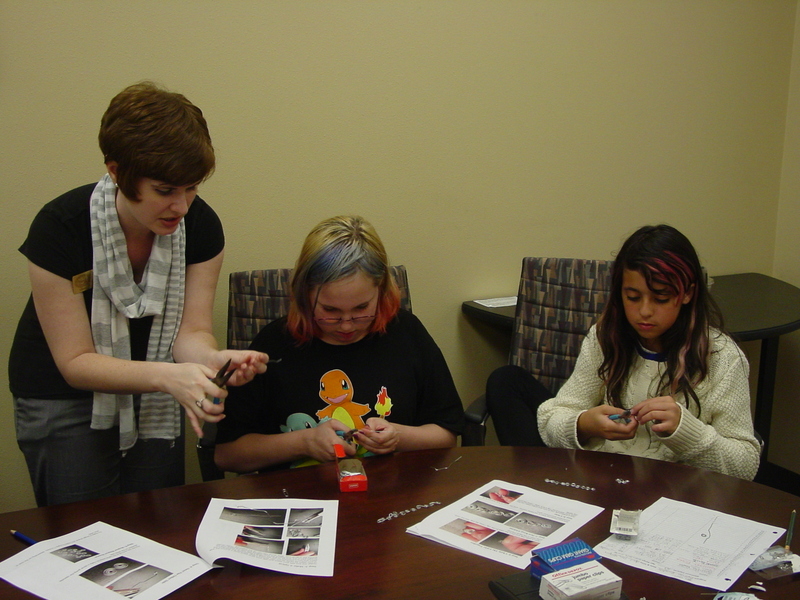 Consequently, I’d recommend keeping your participants in the 6-12 year old range. 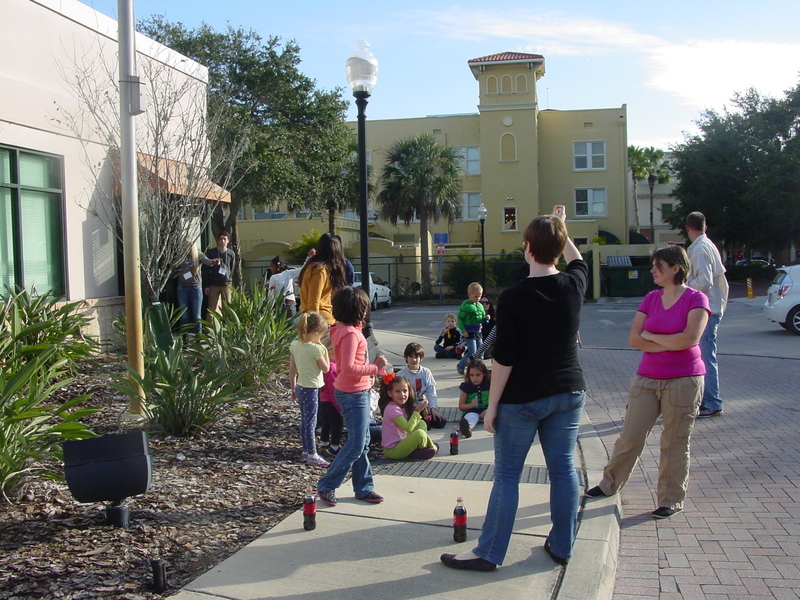 With the help of some volunteers, I explained that molecules are made up of atoms and that molecules get “really excited” when they meet other molecules that are different from themselves. I used this information to explain the concept of nucleation sites, which is how the salt latches on to the CO2 in our soda to “ride” up out of the bottle in a fizzy, gaseous, gush! I carefully had the kids pour salt into their water balloons. 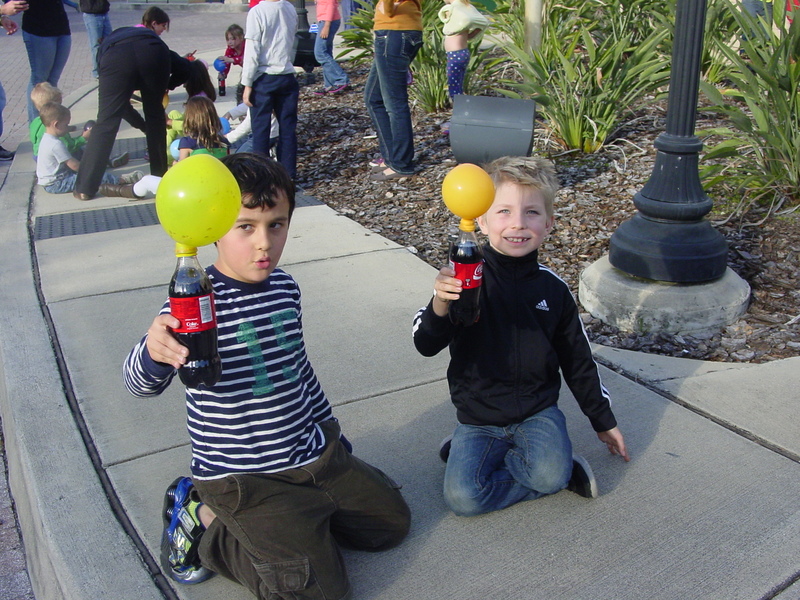 Then we went outside, attached our balloons to our Coke bottles, and watched the chemical reactions! 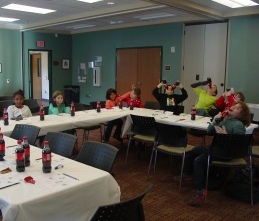 All in all, our kids had a fantastic time with this activity! I’d highly recommend this one. Just make sure you do it outside! So…we finally did it! 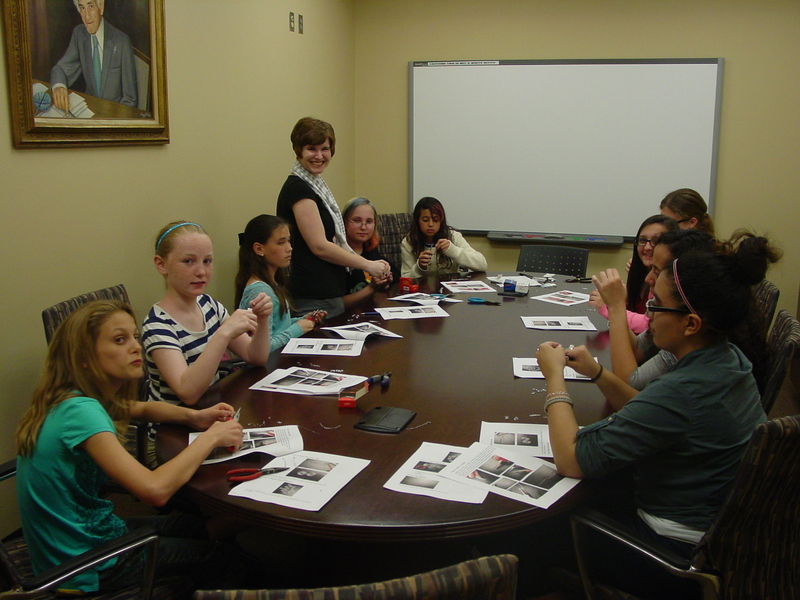 I held my inaugural tween/teen craft at the library and ten girls showed up! 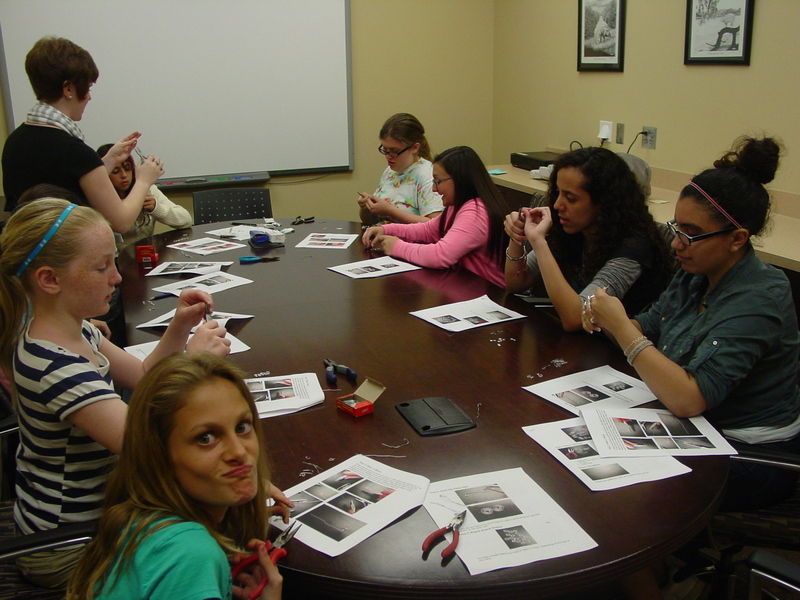 We had so much fun making swirly paperclip bracelets together that I just had to post the photos! I highly recommend this craft for the tween/teen girls in your life. It took some patience and perseverance, but the end results were beautiful! More importantly, we had fun! 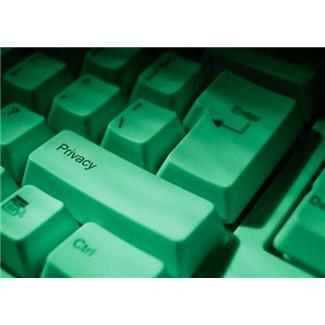 In his article,“2014: The Year of Counterveillance,” journalist Robert Siciliano points out the pervasiveness of privacy issues over the last year. From Edward Snowden and the NSA to Facebook’s new policy’s (which state that they can keep your data in perpetuity and use your images in their advertisements), numerous events throughout 2013 have highlighted just how little privacy we have in this modern, technological era and how easily it is violated (Siciliano, 2014, para 2). What’s more, these issue are not going away. As evidenced by latest techno-privacy threat, Heartbleed, our privacy issues are only going to increase in gravity as technology progresses. I was one of those 40 million Target customers affected by their credit card data compromise. I bought a $2 soda in the check-out line with my debit card and it cost me my financial security. Thankfully, my bank was quick to notice, protected my accounts, and provided me with a replacement card. But I was left feeling more than a little shaken and vulnerable. It’s unsettling to think about just how easily our data can be mined. For example, if I visit a website in one internet tab with Facebook open in another, I’ll start seeing ads in my Facebook bar based on that web activity within a 24 hour period. It’s uncanny. It’s also a little horrifying. I can’t speak for everyone, but the way data mining is going feels a little too akin to 1984 for my taste. Such analytic measures as the ones mentioned above verge on “thought policing” and are the stuff of sci-fi nightmares. So what, then, is our responsibility as 21st century information professionals? How can we protect patron privacy our current times? First and foremost, we need to adhere to ALA policy and staunchly resist any efforts at data mining aimed at our patrons. We are one of the last bastions of privacy left and we need to defend that role. Demanding reasonable cause for information requests from the government (particularly under the PATRIOT Act) is vital. As Rubin (2010) points out, “patrons will not use materials or make inquiries regarding controversial topics if they believe such actions are not free from public exposure and governmental intrusion” (p. 391). The last thing our patrons need is an extension of the data mining intrusions they already experience online. As librarians, we must take care to be discrete with our patrons’ circulation information. On a more practical level, many patrons who engage in online activities are unaware of just how easily they can be taken advantage of. How many times have we heard of seniors being taken in by Nigerian prince scams and the like? Or younger patrons being sexually harassed by online predators? Since part of the library’s mission is educational in nature, librarians could consider offering classes in online safety for all ages to better equip our patrons to protect themselves. We cannot control the data mining efforts of every business and government entity. We can, however, arm our patrons with the information necessary to make intelligent decisions. A final thought: when privacy is threatened, so too is freedom of speech – which is the very bedrock of our democratic society. At the risk of sounding alarmist, we must do our best to protect this right in our role as information professionals. Otherwise, we run the risk of loosing the freedom we so dearly cherish. Rubin, R.E. (2010). Foundations of library science. New York, NY: Neal-Schumann Publishers, Inc.
Sovlove, D. (2008). The future of privacy. American Libraries, 39, 56-59.